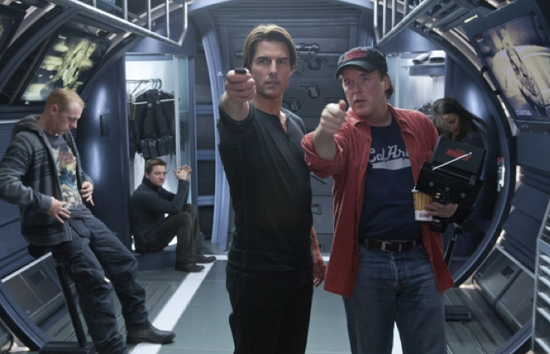 Before he directed Mission: Impossible – Ghost Protocol, which was recently released on video, acclaimed director Brad Bird made his name in the world of animation by directing award-winning films such as The Iron Giant (1999), The Incredibles (2004) and Ratatouille (2007). Is Bird deserving of a place in VOH’s Hall of Visionaries? It is tough to judge the merits of an animation director without having an in-depth knowledge of the art, and at VOH we tend to stay away from that which we know little about. As such, animation directors are not usually part of the discussion, and few have made our visionary list. Brad Bird is one of the few. As a writer/director, Bird has created a trio of incredibly cinematic animated films, and the two that I am familiar with (The Incredibles and Ratatouille) are both richly layered stories that get audiences emotionally involved in the characters’ lives. That they are also side-splittingly funny only sweetens the pot. But with that background, it was not immediately clear to me why Paramount Pictures would hire Bird to lose his live-action directorial virginity on Mission: Impossible – Ghost Protocol, the latest installment of the studio’s action cash cow. Bird is on record as saying he believes he brought an irreverent tone and playful quality to the series, and I’m willing to take his word for it, though I also have to believe the studio hedged the bet by surrounding him with the best support team money could buy. Ghost Protocol is entertaining, even though it still has its corny Mission Impossible moments. Whether Bird is to blame for that is anyone’s guess, but judging by the financial success of the film, he is sure to get another chance at a big live-action thriller. Brad Bird’s visionary qualities were much more apparent in his animated films. His live-action debut was solid enough for him to maintain visionary status, but I hope to see even more in his next outing. His work is inventive, polished and full of high energy, but is filmmaker Brad Bird a visionary? After his successful turn on The Simpsons television show, Bird’s first feature film, The Iron Giant (1999), is still his best. Giant is the animated adaption of 1968’s novel, The Iron Man, by Ted Hughes. It tells the unlikely tale of a friendship between a young boy and his mechanical giant. Through Bird’s mature approach to animation and his patience in developing character, the film establishes a fabulous friendship filled with warmth and emotion between its heroes. The Iron Giant received critical acclaim and garnered many accolades (the American Film Institute even nominated The Iron Giant for its Top 10 Animated Films List). Bird went on to direct highly regarded films for the Pixar juggernaut, The Incredibles (2004) and Ratatouille (2007). And just last summer, Bird made the transition to live action with the Tom Cruise-starrer, Mission: Impossible – Ghost Protocol. All were successful ventures. Bird has a fabulous eye for action, timing and onscreen energy, and his sensibility for character development is also appreciated. A lesser filmmaker would have settled on action for action’s sake in The Incredibles or the anticipated slapstick laughs of a Parisian rat and his love of cuisine in Ratatouille – but not Bird. He listens to his characters and gives audiences richer character motivations. Even last summer’s Mission: Impossible installment was the most overall satisfying outing of the spy series since Brian DePalma’s original, as it included a fun, almost humorous, approach. Still, it’s not an easy jump to think of Brad Bird in the Hall of Visionaries alongside filmmaking legends, such as Hitchcock, Welles or Fellini. Visionaries are driven to explore themes or topics close to their hearts. One of Hitchcock’s leading themes was that of mistaken identity and the pursuit of the truth. Welles continued to mine the drama of power, corruption and morality throughout his brilliant film career. And Fellini’s films unfolded in fantastical, often dream-like qualities, to explore issues of the heart and the spirit. A Visionary’s signature is founded in these themes and in how these themes are pursued. What is Bird’s pursuit? What is his passion? What is Bird driven to explore? It will take more than his virtuoso approach to zany action to call Bird a Visionary. Bird is a talented filmmaker, who has proven that he can succeed in animation and in live action (no small feat, to be sure), but there are many talented filmmakers in the VOH Lobby, who are not Visionaries. I am not sure why Brad Bird’s visionary status is even up for debate, as he should be considered an obvious visionary based upon his already substantial list of accomplishments. A two-time Academy Award winner, Bird has directed some of the most influential animated features films of all-time – The Iron Giant, The Incredibles and Ratatouille. I strongly believe that denying Bird visionary status is the equivalent of denying the legitimacy of animation as an art form. He clearly should be placed in VOH’s Hall of Visionaries alongside directors such as Hayao Miyazki, Satoshi Kon and his Pixar contemporaries such as Andrew Stanton, John Lasseter and Peter Docter. Bird’s films have inspired an entire generation of animators, while raising the bar on what we should expect from animated feature films in terms of both storytelling and technical quality. Furthermore, his work has consistently demonstrated a level of personal vision that only a true visionary director can aspire to reach. Frequently, this personal vision has driven him to explore themes related to individuality, as his films have depicted protagonists combating the powerful forces that impose conformity upon society. Recently, Bird transitioned into the world of live action films by directing Mission: Impossible – Ghost Protocol. Although he was forced to work within the constraints inherent to directing an installment in Tom Cruise’s star vehicle, Bird arguably directed the finest MI film, outperforming seasoned live action directors such as Brian DePalma, John Woo and JJ Abrams in the process. My only fear is that the success of this film and his upcoming live action feature 1906 will permanently remove Brad Bird from the world of animation. The live action world would gain a new visionary, but the world of animation would suffer a great loss. Would the same thing be said for Andrew Stanton? I think Andrew Stanton is definitely a visionary. Interesting point of views. Yeah, I remember reading an interview transcript on him. The guy knows what he’s doing. Better yet, he knows wheres he’s going (vision).